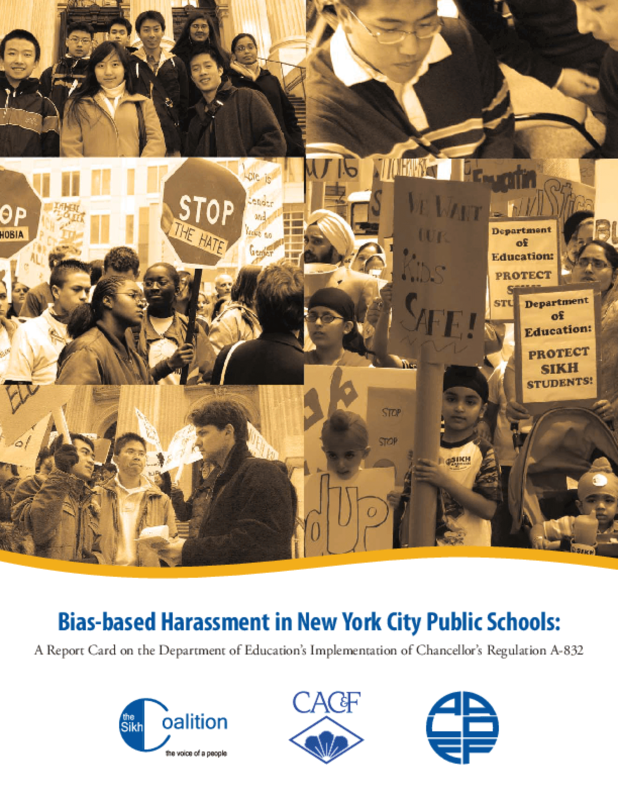 On September 3, 2008, Mayor Michael Bloomberg and Schools Chancellor Joel Klein announced Chancellor's Regulation A-832, which established a procedure for addressing student-to-student bias-based harassment, intimidation, and bullying. Community groups and advocates stood with the Mayor and Department of Education (DOE) leadership in announcing the Regulation, applauding it as an important step in the right direction. Since last fall, The Sikh Coalition, Asian American Legal Defense and Education Fund (AALDEF), Coalition for Asian American Children and Families (CACF), and the New York Civil Liberties Union (NYCLU) have been leading an initiative to monitor and assess the implementation of the new regulation. Th rough surveying over 1,100 students and educators in New York City public schools, we have learned that a wide gap exists between the mandates and promise of the Regulation and the condition of our youth in City schools. This Report Card summarizes the findings of these surveys and provides an assessment of the implementation of Chancellor's Regulation A-832 in the first school year of its existence. Copyright 2009 Asian American Legal Defense and Education Fund (AALDEF), Coalition for Asian American Children and Families (CACF), Sikh Coalition.